Add a familiar and beautiful bird of prey to your property with the Jackite American Bald Eagle Kite and Fiberglass Telescoping Pole Kit. This fantastic kit provides a realistic bird kite, telescoping fiberglass pole, and line for attaching it. The majestic, Jackite American Bald Eagle Kite soars, moves, and beats its wings in the wind, adding a realistic look to your garden or boat and helping deter predators. The generous, 60" wingspan of the eagle creates a realistically sized silhouette, furthered by the brown, tan, and white hues and the fish in its talons. Its lasting, Tyvek body ensures a water and tear resistant item, while an included fiberglass rod installs in the body of the kite for stability and shape. Affix the included Jackite Windsock Line Rig to the bird to easily fly it from the included Jackite Black Fiberglass Telescoping Kite Pole. The line rig provides 7' of durable, nylon cord, and a swivel on each end minimizes winding. The pole extends up to 28', and may be secured to a vertical pole or post with rope or cord (not included) for a wonderful display. Its black, fade resistant finish offers a traditional look, while the fiberglass construction ensures durability. This pole compacts to 45.75" in length for easy storage, and two winding clips help secure the line rigging. This package is fantastic for use on your boat or in your garden, the bold realism of the eagle acting as a deterrent for other birds. 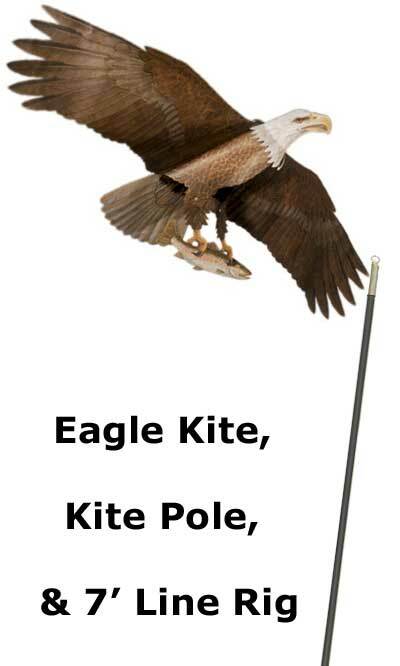 Place a lovely and realistic bird of prey in your yard with this American Bald Eagle Kite and Fiberglass Telescoping Pole Kit. Assembly required. Kite and line made in the USA. Ninety day limited warranty on kite and pole.